Of course, I will skip the story about the jailbreak procedure, we have lots of them already in the Web. I will only tell this — the last (as of the date of the article) version of iOS (7.1.2) was easily hackable by Pangu. 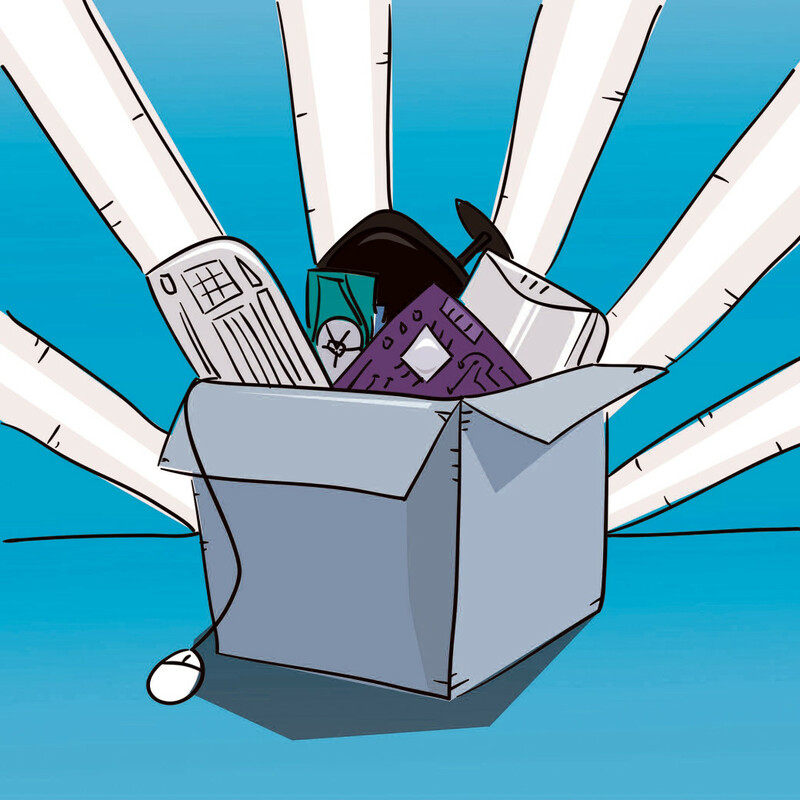 Everything’s easy: connect the device to PC, install Pangu and follow its instructions. Pangu opens file system and installs Cydia as a system application. Thereafter, you can just run Cydia, browse around standard repository and, of course, add third-party repositories. Browsing around the websites telling about Cydia tweaks and apps, you will surely come across lots of articles à la “top 10 tweaks from Cydia” telling about iCleaner, iFile, WinterBoard, Springtomize and other boring Activators. Those are really star tweaks, but today we are going to speak rather about less renowned but useful and unusual representatives of Cydia family. Let’s go. Let’s begin with the tweak OS Experience. It is a realization of multiwindow mode in OS X style for iPad. Many users expected emergence of multiwindow mode with system iOS 8 announced, while independent developers, having taken a deeper look in iOS 8 firmware, even managed to find some hints to this mode, however the function itself has never been added. Fortunately, Evan Swick made a tweak OS Experience and released it in Cydia. After tweak installation you will have desktops, where you can open several apps at a time, moving between desktops dragging apps along. You will be able to change window size and place it where you feel fit. A truly multiwindow environment for non-inessential 9.99 USD (BigBoss repository) requested by Evan Swick. ProWidget tweak related thereto is based upon a bit different concept. It creates floating widgets of a sort, but not exactly the ones we are accustomed to on desktops and Yandex page. These are fully-featured mini-apps run in a separate window and easily draggable around the screen (but let’s not call them widgets after all). The following widgets are present in ProWidget by default: ‘Browser’, ‘Notes’, ‘Reminder’, ‘Message’, ‘Calendar’, ‘Mail’, ‘Alarm’, ‘Timer’. Each of such apps operates above the current window without unloading out of memory until closure. The tweak is accessible in BigBoss repository for 2.99 USD. Moreover, Cydia contains lots of additional widgets for this tweak. And now, the big guns — Auxo 2 — one of the most popular tweaks for iOS. Auxo gained popularity due to reconsideration of multitasking nature of the Apple devices. The first version of the tweak added app preview, which was exotic for iOS 6. Multitasking of iOS 7 is on different level and app preview have become available by default. After much thought about the new concept, the developers issued Auxo 2 for iOS 7, having added more interesting and convenient things. In Auxo 2, the developers did their best to associate control center and open apps, which can be scrolled through and closed with swipes. Control center was divided into two parts with player and quick access to apps in the bottom part, and buttons for turning on and off various services — in the top one. A new Quick Switcher function appeared: drawing a finger from left corner up you will see six last apps, whereto you may switch without removing the finger. Auxo 2 is universal, and does excellent job both in iPhone and iPad. It is available in BigBoss repository for 3.99 USD (or 1.99, if you already have the first version). GlowBoard is another interesting tweak. Highlighting launched apps by background fluctuating glow around the icon is all it does. Along with running apps, those where unread message is present will fluctuate as well. It is a perfect motivator making you open an app to read a message or learn about an event. The tweak has multiplicity of settings, from background highlight color to the manner the app will bounce at message receipt. It is available in BigBoss repository for free. For those who loves playing with fonts, I recommend Bytafont 2 tweak. Steve Jobs had surely been tweaking the system for a long time (probably even for too long) selecting fonts, however tastes differ even among close relatives. Therefore, run Bytafont 2, choose (or find in Cydia) the font you need, enter Bytafont 2 settings and choose. Any font may apply either for entire system, or separate applications. Bytafont 2 is available in ModMyi repository absolutely gratis. And at last, one of the most convenient and useful tweaks — FullScroll. It does one simple thing — hides the status bar and navigation panel during app window content scroll. Actually, it is an analog of Chrome and Safari functionalities in iOS 7, applicable for the entire system and apps. It is equally convenient both for browsers and other applications such as settings, AppStore, iTunes, and social apps. Panel hiding option may be disabled for individual apps. BigBoss repository. Null price. And now about weather. StatusbarWeather7 is one of the most apt tweaks with weather information. Actually, adding weather information to status bar making it available everywhere and anytime is all it does. For settings, you will need city code available on any weather website. It is available in BigBoss repository for free. Wi-Fi is vital for any device, and in a megacity we connect to and disconnect from Wi-Fi networks dozen times a day, and each time we need to reach the settings to select the network we need. Vestigo tweak enables choosing network and connecting thereto without entering settings. Vestigo concept is borrowed from OS X. 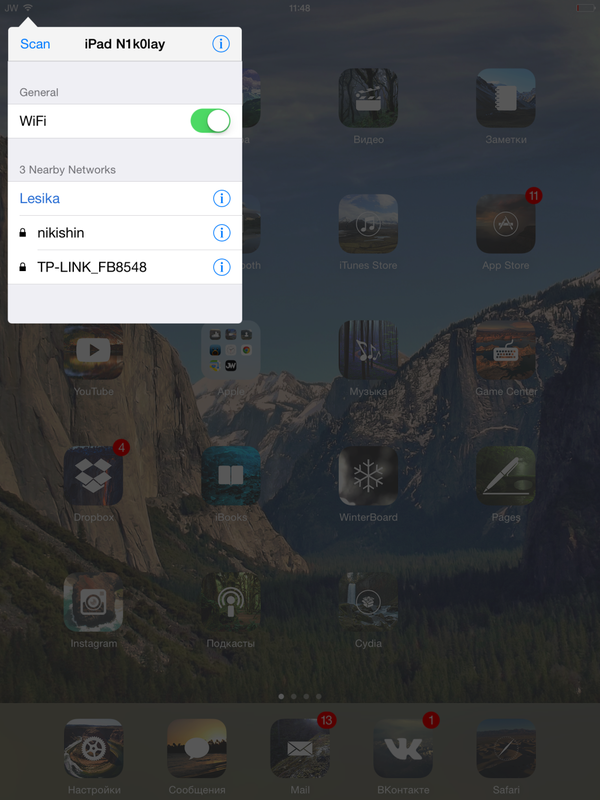 By double-clicking the status bar (set by Activator) a window appears, where you can handle Wi-Fi networks as you please. As a bonus thereto, you receive both standard and additional network information, which is normally inaccessible in iOS by default. E.g. Wi-Fi network saved password, signal level, channel, encryption approach, AP mode, SSID, and other information. All that is copiable by pressing relevant parameter. Vestigo is accessible in BigBoss repository for 1.59 USD. Apropos of limitations. iOS is packed with them, and one of the most stupid and unreasonable of them is limits for traffic use in mobile networks. By default, you may not download more than 10 Mb via GPRS/EDGE, you won’t be able to view YouTube video in HD quality through 3G, many VoIP clients and online games won’t work, while 100Mb quota applies to download of games and apps from App Store, as well as m-media from iTunes. 3G Unrestrictor lifts all those restrictions. Its price is 3.99 USD in standard Cydia repository. Another limitation is a lame functionality of Wi-Fi access point, which is realized as if for the sake of appearance only. 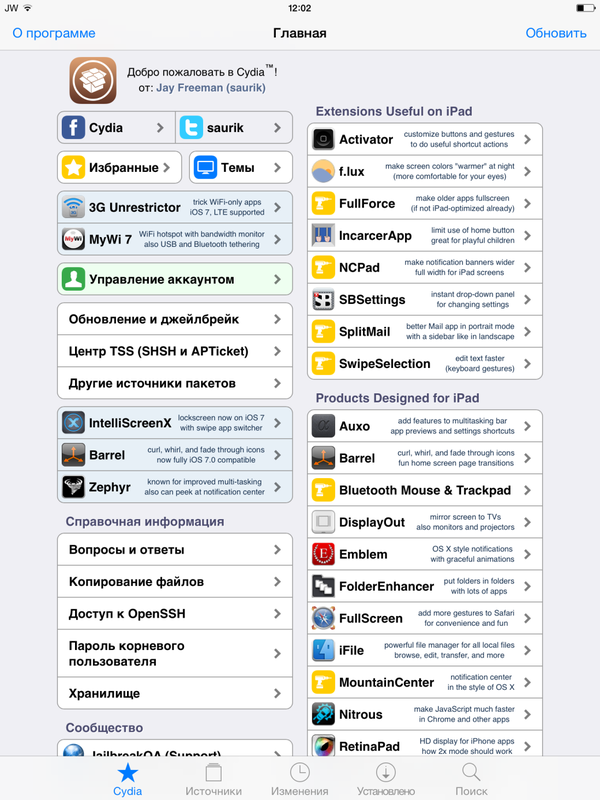 MyWi tweak widens its possibilities essentially. You may create a Wi-Fi access point with own settings (name, password, encryption method, etc. ), adjust Internet distribution through Bluetooth, distribute Internet to PC via USB and create a local network between two devices with data exchange (MyWi OnDemand tweak should be installed on both devices). The only shortcoming of MyWi is its eye-watering price. Developers ask as much as 19.99 USD for MyWi and 4.99 for MyWi OnDemand. Every second user of iOS devices is a melomaniac. We use a lot of various services and players for listening to music: standard app, SoundCloud, Google Music, VKontakte. Common shortcoming of nearly all of these apps is missing equalizer. Presets are there, of course, but they only operate for the standard app. EqualizerEverywhere solves the problem adding 10-band equalizer to the control center. 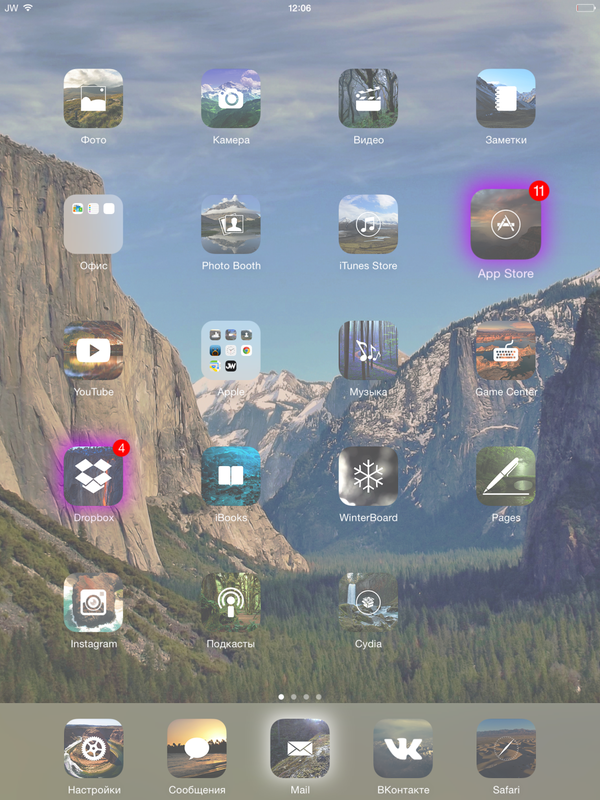 Apart from the fact that the tweak has lots of presets, it operates absolutely everywhere covering the entire system. You may increase bass for music, decrease too screechy screams in another zombie game or change a ringtone. The tweak is accessible in BigBoss repository for 3 USD. VideoGestures is another interesting tweak. It adds swipes to the standard iOS video player. After installation new swipes appear: up/down and left/right. Up and down swipes will change video volume, while left and right swipes will rewind the video. The tweak has settings where you can regulate rewind speed or volume. It is available in BigBoss repository for free. And finally, Arco — a tweak realizing indicator reflecting progress of the reproduced track in the status bar. Arco works with any audio app. Unfortunately, you cannot control reproduction by pressing the icon, but this can be implemented by Activator tweak. The price: 0.99 USD in BigBoss repository. Well, control then. In an operating system so polished as iOS, it is hard to imagine anything new in terms of usability enhancement, and still can-do men appear now and then. Which can be demonstrated by tweaks SwipeSelection, KeyCuts and TapTheAt. The first one is a very modest but useful tweak for text scrolling. Actually, it substitutes the magnifier with swipes. It is distributed gratis with an option of paid version with additional set of gestures and settings (for 1.99 USD). KeyCuts adds four gestures to the keyboard, each individually adjustable and programmable for certain action. KeyCuts comprises about twelve actions for a gesture. Moreover, the tweak may be set so that gestures would apply just to certain row of symbols rather than entire keyboard, which may exclude incidental swipes (BigBoss repository, 0.99 USD). And finally, TapTheAt, one more free tweak for keyboard adding ‘@’ key, after tapping which, your email address appears in the input box. No big but still a pleasant thing. Now about something more interesting. Acute is a tweak enabling device control by voice. Unlike Siri, it gives an opportunity of assigning own commands for various actions. In addition to the set of standard actions with charactonyms Home, Unlock, Illuminate, Power Down, Capture, Marco, you may create your own ones using Activator. The tweak sure requires training to get accustomed to your voice. BigBoss repository, price — 3 USD. ASLock. If you do not use Spotlight often or at all, swipe down gesture may be substituted by a more useful action. ASLock substitutes opening Spotlight by swipe down for device locking, and, if after swipe down you make swipe up without removing your finger, multitask screen will open. BigBoss repository, price — 0.99 USD. HandFree. Picking up the phone may often be inconvenient, if you are driving or preparing lasagna. HandFree is created for such situations. After tweak installation, you will be able to pick up the phone just passing your palm over the smartphone. The system will pick up and turn on the loudspeaker. Number of strokes, stroke speed and disable loudspeaker activation. BigBoss repository, price — 0.99 USD. Apple File Conduit 2 replaces standard AFC (Apple File Conduit) service used for access to files of the device via iTunes. By default, AFC provides access to user directory only (/private/var/mobile/Media), which restricts possibilities of interaction with the device. Apple File Conduit 2 is a modification of standard AFC, which provided access to the file system root directory. As soon as you install it, you will be able to exchange any files with PC using iFunBox or iTools. Unlike afc2add, it works with any iOS version. ProfilesPlus is a tweak enabling setting profiles by time, date or location. It is essentially a simplified analog of Tasker from Android. Choose time or location and specify components of smartphone/tablet that should be turned on or out at this time or in this location. An example: switching GPS when leaving home, or muting at work. Apex 2 reconsiders folders or rather replaces them completely. After choosing e.g. Twitter client, you may add the VKontakte, Facebook, Instagram and Foursquare. Opening app group is possible by double tap or swipe up or down, and then icons of added social network will appear from all four sides, which can be launched as well. It looks very nice, but the main think — it is convenient. An ideal variant for dock panel (the price is 2.99 USD). pushNotify translates i-device notifications to a Mac. To work at a Mac, a same-name software should be installed and both devices should stay within the same Wi-Fi network. BigBoss repository, price — 0.99 USD, Mac app. CCSystemStatus adds information about the IP address of the device, Wi-Fi network, mobile network, random access memory available, processor load and many other things to the control center. As a bonus, there is an option of customization of the control center: change of the order of blocks, their visibility, etc. Gratis. 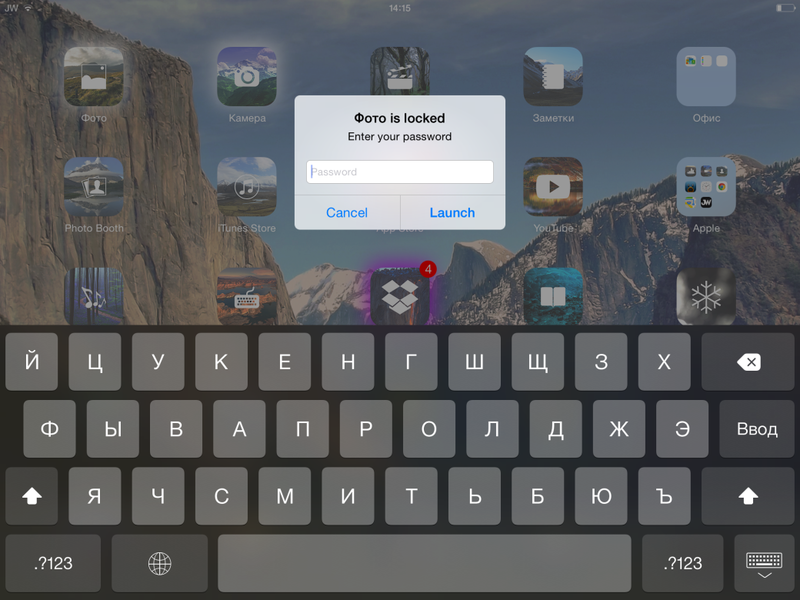 AppLocker — the tweak was developed in 2011 already, but it is still topical and updated steadily. AppLocker enables protection of applications and folders not just by password but by fingerprints as well, using TouchID. AppLocker is really a cutting-edge tweak and has a lot of settings, e.g. disabling apps in certain Wi-Fi networks. AppLocker won’t give access for an intruder to an app, even if it is launched otherwise than from desktop. Password is applied to the app rather than the icon. 0.99 USD, BigBoss repository. Flex 2 is a tweak enabling editing application files thus modifying or removing some objects. In plain English, Flex 2 enables creating patches. You can make them yourself or download from cloud. For many apps, there are ready patches already from various developers, from ad removal to game internal currency change. It is accessible in BigBoss repository for 1.99 USD. If you are already in the know of jailbreak, we hope, you still learned something new. Many people will consider our choice unreasonable, others will shout that the most useful part was skipped, some will say that all that does not work for iOS 8 already. Anyway, Cydia is an enormous ocean of software and tweaks, where everyone can find exactly what they look for.